Cat people are continuously learning new things. Some are small… like if kitty will eat nothing but turkey and giblets cat food and you catch it on sale at a great price, kitty will no longer like it. Or that although cats have excellent vision, they cannot see you standing in the hallway when they are traveling at speeds exceeding 120 miles per hour. And we all learned early on that no $20.00 cat toy is as much fun as the package it came in. I see from your confusion that you are thinking, "What IS he rambling on about? This is supposed to be an update on The Tortie!". Well, yes I am and yes it is. You see, one of the lessons I have learned is my office chair has wheels and my cats have tails. It’s a predator/prey kind of situation. Fine, you say, but what the devil does any of this have to do with The Tortie!!! 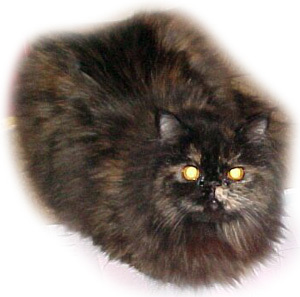 As you probably know, we believe The Tortie to be a trifle recalcitrant. Or, as my saintly grandmother would have said, "She’s meaner than bat feces". That’s not exactly what Grandma used to say, but close enough. So having progressed from The Tortie living behind the dresser to living inside her cage, I have been slowly trying to get her to accept my presence. We began simply enough... if The Tortie wants to eat she must do so while allowing me to touch her. If this sounds cruel, please consider this… I am the one at risk. The worst she had to worry about was having to eat plain dry food instead of her meat. I was the one facing possible mutilation. At first, she decided that dry food was the lesser of two evils, but when she found out I had paid full price for the turkey and giblets she wanted it bad! So, scratching ears became acceptable. Giddy with my progress, I decided the next step would be for The Tortie to begin eating outside the cage. Behind closed doors, with five pairs of eyes peeking underneath, I set The Tortie’s breakfast just outside the cage door then sat down to check my email. For several hours, The Tortie would step to the open door and crane her neck to reach the food dish. Maybe it’s just a tortie kind of thing, but it took her this long to discover feline necks are not telescopic. Finally, she ventured the few feet from the cage and began to eat. Afterwards, she returned to the cage and sat just inside the open door pondering this new development. Much to her surprise, monsters didn’t leap from behind furniture, the ceiling didn’t collapse upon her and, most shocking of all to her, I didn’t suddenly pull a knife and begin chasing her around the room, laughing maniacally. It was apparent that her little Tortie head needed time to process this information. For several days this ceremony was repeated over and over again. She ventured forth, ate, and returned to her safe haven. Then one morning after she finished eating she didn’t immediately go back to the cage. She simply sat next to her dish and watched me. From the corner of my eye, I saw her oh so cautiously begin to approach me. After sniffing my shoes, she sat down, looked up at me and said, "Meow". It was the first time I had ever heard her make a sound that wasn’t threatening. In those two syllables, I heard "Hello. Let’s talk. Now, just who are you and what’s your story?" Over the next few days The Tortie laid down some ground rules. Ears and backs may be scratched. Tails are off-limits. Touching bellies is asking for trouble, even if it is offered to you. Attempting to pick up a Tortie carries a death penalty. My acceptance of these rules led to an armistice. In return, I was allowed the privilege of petting The Tortie. Given these conditions, The Tortie began to take her after meal naps at my feet while I worked on the computer. Peace and harmony reigned and birdies sang from the treetops. What a happy ending to a otherwise sad tale! Tale? That reminds me… remember these three parts of the story? 1.) The Tortie now naps at my feet. 2.) Tortie tails are off-limits, and 3.) My office chair has wheels. You know, I’m beginning to understand why The Tortie was happy to go in the cage. It’s pretty comfortable in here. Paul Sandel caught the cat show bug in 1973 at a young age. Shortly after that he saw a Black Smoke Persian at a show and was hooked. He states, "I was so excited when I finally purchased my first smoke, I felt the urge to lie back against the headboard and have a cigarette. Unfortunately, I was only 13." Paul stayed with the fancy into adulthood, eventually becoming an ACFA judge. 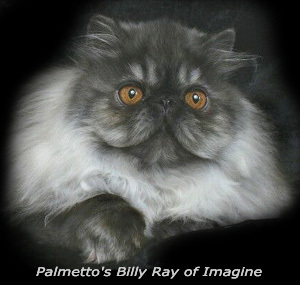 He was forced to retire from cats to care for his mother when she became ill with Alzheimer’s disease. 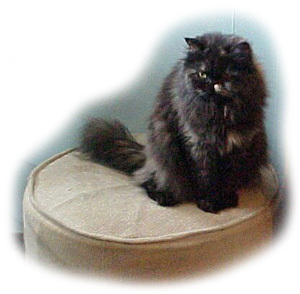 Late last year, Paul was able to return to the show hall and is currently working on rebuilding the Smoke Persian breeding program of Imagine cattery. He remains under 24 hour psychiatric monitoring.